An Attempt to Assess the Impact of Increased Human Use on Bosque Birds /Hawks Aloft Inc. The recent plans put forth by the City of Albuquerque to increase access to the Albuquerque bosque through the development of new interior gravel trails, etc. made us wonder if/how increased human use of the Rio Grande bosque impacts the avian community. But, finding an accurate way to quantify any impact is problematic. Although we do document all humans (and dogs) encountered during our surveys for the Middle Rio Grande Songbird Study (MRGSS), this provides only brief snapshots of human use in any given area. 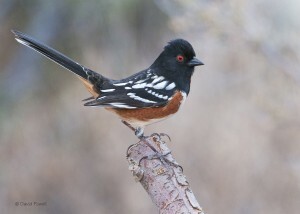 The Spotted Towhee is one species under study in the Rio Grande Bosque. Photo by David Powell. While birds obviously move around a lot, a majority of the species and individuals we document live in the bosque and, therefore, are consistently present in a given area during any particular season of the year. In contrast, humans (and their canine companions) are much more transient within the bosque. Human use not only varies among seasons and is based on weather conditions, but may be drastically different from hour to hour on any given day. Because our surveys occur during the early morning hours, we also likely miss peak human use times. In addition, the vast majority of the 78 transects we survey in the 79-mile stretch of bosque between Rio Rancho and La Joya Waterfowl Management Area are not heavily frequented by people. In fact, we rarely encounter people on most of our survey transects. Even in areas where we regularly encounter people, such as Albuquerque and Corrales, the numbers are surprisingly low, averaging around one person per visit. 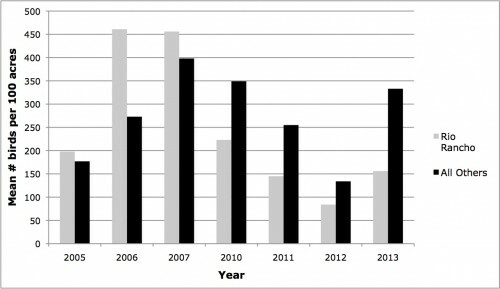 Finally, human (and canine) use of the bosque has generally been consistent across the first 10 years of the MRGSS. The one exception to this is Rio Rancho, where we documented a substantial increase in human use after the 2009 construction of an 8-foot wide gravel trail that loops around their Willow Creek Bosque. 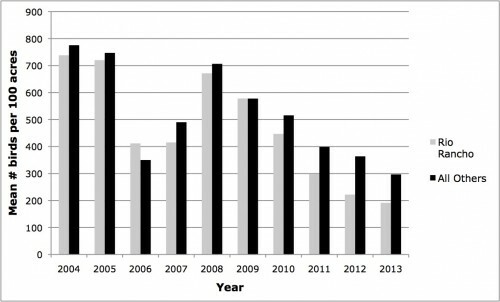 For example, the number of people/dogs we documented during surveys in 2004-2009 ranged from 2 to 9 per year during winter and 9 to 75 per year during summer, while the number of people/dogs documented during surveys in 2010-2013 ranged from 35 to 64 during winter and 93 to 275 per year during summer. 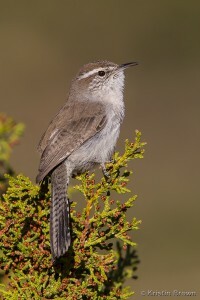 The Bewick’s Wren is another species under study in the Bosque. Photo by Kristin Brown. With the above limitations in mind, I attempted to quantify the impact of increased human use of the Rio Grande bosque on the avian community based on our observations in Rio Rancho. I used correlation analysis to compare bird numbers within 30 m of our transect lines with the numbers of humans and dogs encountered across the first 10 years of data we collected (2004-2013). Because understory species are likely to experience more direct impact due to human use, I also compared understory bird numbers within 30 m of our transect lines with human/dog numbers across years. I defined understory birds as species that spend the majority of their time and/or nest from 0 to 2 m off the ground. Examples of common understory species would include Spotted Towhee, Dark-eyed Junco, White-crowned Sparrow, and Yellow-breasted Chat. Because our data do not meet the assumptions of normality, I used non-parametric Spearman’s rank correlations to quantify any relationships between bird numbers and human/dog numbers. An explanation of the terminology used to evaluate correlations is provided in the caption for Table 1. I combined human and dog numbers to increase statistical power, and also because the dogs enter the bosque with their human companions and unleashed dogs likely increase the impact on the avian community. I also compared avian density at Rio Rancho transects with the density at transects in the same habitat types outside Rio Rancho. The three habitat types we survey in Rio Rancho are C-2 natural (mature cottonwood canopy with a relatively sparse woody understory), CW 6 (relatively sparse vegetation dominated by coyote willow and averaging less than 2 m in height) and OP (open habitat with limited woody vegetation). 2004-2013 (see Table 1), suggesting that increased human/dog use negatively impacted birds. There was a very strong (and statistically significant), negative monotonic correlation between understory bird numbers and human/dog numbers during summer (rs = -0.81, n = 10, P < 0.005). There was a strong (and nearly significant), negative monotonic correlation between understory bird numbers and human/dog numbers during winter (rs = -0.75, n = 7, P < 0.052). Similarly, there was a strong, negative monotonic relationship between all bird numbers and human/dog numbers during winter (rs = -0.71, n = 7, P < 0.071). There was a moderate, negative monotonic relationship between all bird numbers and human/dog numbers during summer (rs = -0.55, n = 10, P < 0.098). Comparison of avian density (mean number of birds per 100 acres) in Rio Rancho with areas outside Rio Rancho possessing the same C/S types indicated that bird numbers have been lower in Rio Rancho than elsewhere during both winter and summer since 2010 (see Figures 1 and 2), which is when we began documenting increased human/dog use in Rio Rancho following the establishment of a wide, gravel loop trail. During winter, in the three years we surveyed prior to 2010 (we did not conduct winter surveys in Rio Rancho during 2008 or 2009), avian density in Rio Rancho was actually higher than other areas possessing the same C/S types. But, during winters 2010-2013, avian density was substantially lower in Rio Rancho than other areas possessing the same C/S types. During summer 2004-2009, avian density in Rio Rancho was generally very similar to other areas possessing the same C/S types. But, in summer 2010-2013, avian density was again lower in Rio Rancho than other areas with the same C/S type. Table 1. Summary of Spearman’s rank correlations evaluating the relationship between bird use and human use in the Rio Rancho bosque, by season, 2004-2013. Bird numbers for all correlations were based on detections within 30 m of transect lines. Correlation coefficient (rs) values can range from “-1.0” (perfect negative correlation) to “1.0” (perfect positive correlation). A coefficient of “0” would indicate no correlation between the variables. A coefficient in the range of “-0.40” to “-0.59” represents a “moderate” negative correlation; a coefficient in the range of “-0.60” to”-0.79” represents a “strong” negative correlation; and a coefficient in the range of “-0.80” to “-1.0” represents a “very strong” negative correlation. Statistical significance of P-values was set at P < 0.05. Our data for Rio Rancho indicate that increased human use of the Willow Creek bosque since 2010 has negatively impacted bird numbers during both winter and summer. Spearman’s correlations between bird numbers and human/dog numbers generally showed strong to very strong negative correlations, especially in regard to understory species (i.e. there is a strong correlation between increased human/dog use and decreased avian use). Additionally, avian density in Rio Rancho has consistently been lower than avian density in other areas with the same C/S types since human use began to substantially increase in 2010. Although our sample sizes are relatively small, it seems reasonable to assume that similar decreases in birds would occur elsewhere in the middle Rio Grande bosque if similar increases in human/dog use were to occur. These results intuitively make sense. An increase in human use results in increased disturbance to birds. While many bird species tolerate occasional human disturbance, as the frequency of that disturbance increases it becomes more difficult for birds to tolerate. This is especially true for understory species that breed, forage, and seek cover near the ground and have the most direct contact with passing humans. It is well established that human disturbance can lead to nest abandonment. And, over time, some bird species may simply abandon areas (as breeders or non-breeders) where disturbance is continual, even if the habitat structure and qualities are desirable. The introduction of unleashed dogs creates a more dangerous situation for birds. Although the perpetual presence of passing people (and leashed dogs) may be an annoyance for birds, uncontrolled dogs create a direct threat. Dogs running loose and off-trail damage habitat and may directly cause nest abandonment, nest destruction, or even kill birds. Although an increase in human use doesn’t necessarily equate to an increase in unleashed dogs, we have noticed that such a trend does exist throughout the middle Rio Grande bosque. Fortunately, the threat to the avian community (and the bosque ecosystem as a whole) from uncontrolled dogs can be mitigated. But, that requires a willingness from dog owners to be responsible when they enter the bosque. Finally, although our data indicates that increased human use has negatively impacted bird numbers in Rio Rancho, there are additional factors that need to be considered. First, the perpetual removal of non-native, woody vegetation and mowing of weedy vegetation on an annual (or greater) basis in Rio Rancho since at least 2009 (and sporadically in prior years) has certainly had a negative impact on the avian community. Secondly, the establishment of a wide, gravel loop trail in the Willow Creek bosque has not only led to increased human presence, but also increased habitat fragmentation. Related to that has been an increase in off-trail use and the creation of “unofficial” trails since the gravel loop trail was established. These “unofficial” trails have further increased the habitat fragmentation and disturbance of the Willow Creek bosque as people have found it easier to explore previously less accessible areas and perhaps searched for a more secluded bosque experience. All of these factors have certainly had an impact on the avian community. From a broader perspective, the negative impact these factors have had on the avian community (and likely the cumulative wildlife community) in the Rio Rancho bosque should be considered by land managers throughout the middle Rio Grande as they consider their own management strategies. Figure 1. Comparison of winter avian density (mean number of birds per 100 acres) by year in Rio Rancho and in other areas supporting the same C/S types. Density estimates are based on bird detections within 30 m of transect lines. We initiated winter surveys in Rio Rancho in 2005, and did not conduct winter surveys in Rio Rancho in 2008 or 2009. Figure 2. Comparison of summer avian density (mean number of birds per 100 acres) by year in Rio Rancho and in other areas supporting the same C/S types. Density estimates are based on bird detections within 30 m of transect lines.